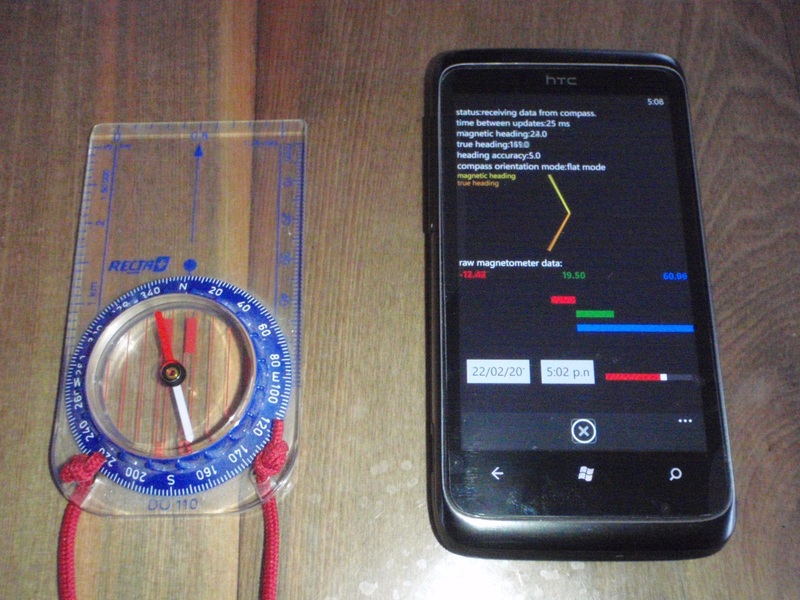 My HTC Trophy 7 and Nokia Lumia 800 seem to be having an issue determining true north from magnetic north. 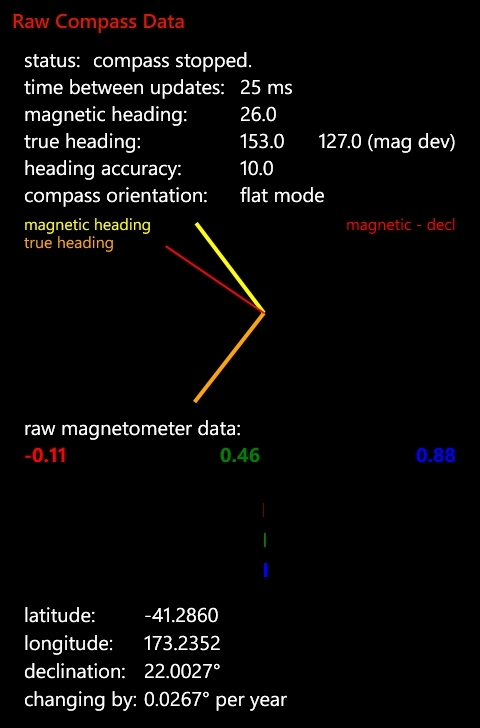 The magnetic north detection is correct (the light yellow line that matches the actual compass) but the magnetic declination is out by about 90°. The resulting true north is shown as the orange line. It should be about 22° to the west of magnetic north for my location. 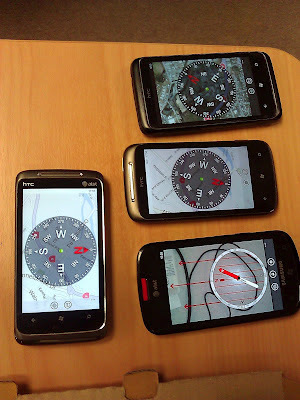 You can use Raw Compass Data from the Marketplace to check the compass on your own phone. 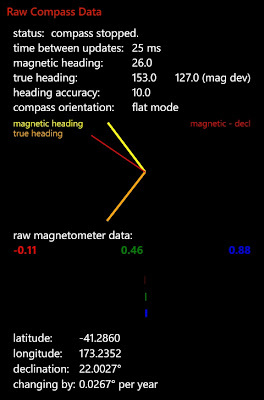 Stack Overflow: How does the WP7 CompassReading determine the TrueHeading from the MagneticHeading? HTC support - correspondence exerts below. Microsoft answers: Faulty compass on Windows Phones... will there be a fix? The compass on my phone is out by 180 degrees. I.e. North is actually pointing South. It is the same in several applications so it appears to be an issue with the phone rather than the app in question. There was then a bit of correspondence to determine the IMEI for my phone and OS version (7.10.7740.16) at the time. Thanks for replying to HTC. The link states that some service and features might not be available or might behave differently after the update. Usually, there are some unexpected bugs that occur whenever there is new software written. Though the Windows Mango is just an update to the Windows 7 platform, it contains a big number of new features. If there is an unexpected bug, it would take time to test, isolate and come up with an update to fix the said issue. For the meantime, we suggest that you perform a factory reset. This usually fixes the issues that arise from updating the software. Hard reset is same as restoring your HTC phone to its default settings - the way it was when you first purchased it and turned it on. Please be advised that doing a factory reset will delete all your data (such as contacts, calendar notes, SMS and installed applications) in your phone memory. You will not be able to recover the information once they are deleted. We have attached the user guide in performing factory reset for your reference. Should you need further assistance, please feel free to share your preferred contact schedule with us as we would be more than happy to contact you directly over the phone. I've done some further investigation on this after developer unlocking my phone. It would appear that the magnetic compass heading returned by the Magnetometer is correct but the resulting true North heading is significantly out. The phone is giving a magnetic declination of approximately 130° which seems wrong given my current latitude and longitude. How does the phone determine the magnetic declination? Is it part of the WP7 operating system or part of the phone? Do I need to enable location services to get the correct value? We appreciate the prompt reply. We recommend getting in touch with your retailer to have the phone assessed. We are only relying on the updates that Microsoft is sending. The distributors of the phone customizes them. 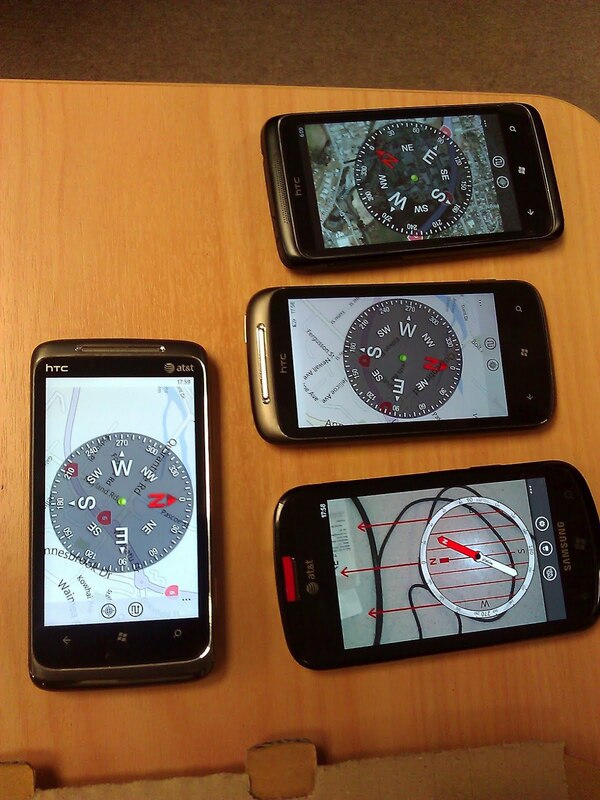 I notice this same compass issue on my HTC Titan (X310a). Sadly no. My only conclusion by now is that Microsoft are aware of the issue/bug and haven't decided to fix it yet. I think things are better with WP8. I don't have much hope for WP7 getting a fix after all this time. Sometimes the compass points correctly, sometimes not (even if accuracy is still reported as "high"). Trying different apps, it seems some are better at smoothing out glitches but in the end it is most likely caused by the phone hardware or operating system.